By Todd Abelson NMLS #180858 on January 21, 2019 . The stock market recorded its fourth consecutive weekly gain to drive the S&P 500 Index and Dow Jones Industrial Average to within 10% of their recent highs although the NASDAQ Composite Index has yet to regain this threshold. Longer-term bond and Treasury yields increased during the week as a consequence of the gains seen in stocks and favorable economic data. Investor sentiment continues to be influenced by rumors surrounding trade negotiations between the U.S. and China. Thursday, the Wall Street Journal reported U.S. Treasury Secretary Steven Mnuchin proposed the lifting of tariffs on some, or all, Chinese imports during negotiations as a sign of good faith bargaining. Although this news was later refuted by the White House, investors were encouraged by the softening in tone of negotiation rhetoric. Friday, Bloomberg reported China had made an offer earlier this month during trade negotiations to increase the amount of U.S. imports resulting in a balance of trade with the U.S. by 2024. However, U.S. officials rejected this target date and demanded quicker results. The week’s economic data seemed to grow more favorable as the week unfolded. Tuesday, the New York Empire State Manufacturing Index showed a sharp slowdown in activity in January with a reading of 3.9 compared to December’s value of 11.5 and an estimate of 12.2 for January. This was offset by Thursday’s release of the Philadelphia Fed Manufacturing Index covering the larger mid-Atlantic region. The Philadelphia Fed Manufacturing Index came in at 17.0 for January compared to December’s value of 9.1 and a consensus forecast calling for a reading of 10.5. Friday’s release of Industrial Production was also favorable and a Federal Reserve index of manufacturing output recorded its largest gain in December in almost a year. 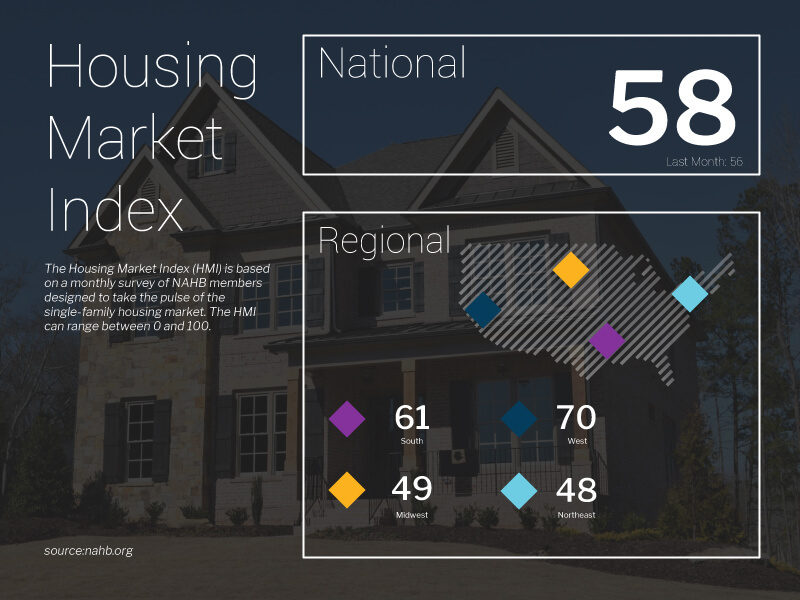 In housing news, the National Association of Home Builders (NAHB) released their Housing Market Index (HMI), a measure of builder opinion on the relative level of current and future single-family home sales. The latest reading for January came in at 58, up two points from December’s number and the consensus forecast. A value above 50 indicates a favorable outlook on home sales while a number below 50 signifies a negative outlook. Current sales conditions rose two points to 63 while sales expectations over the next six months increased three points to 64. Buyer traffic through new home models increased by a point to 44. According to the report, the three-month moving averages for regional HMI scores all slipped lower. The Northeast fell five points to 45; the Midwest declined three points to 52; the South slipped three points to 62; and the West region decreased by a point to 67 in January. As for the latest mortgage data from the Mortgage Bankers Association (MBA), the weekly mortgage applications survey showed the number of mortgage applications increased from the prior week. The MBA reported their overall seasonally adjusted Market Composite Index (application volume) increased 13.5% for the week ended January 11, 2019. The seasonally adjusted Purchase Index increased 9% from a week prior while the Refinance Index increased 19%. Overall, the refinance portion of mortgage activity increased to 46.8% from 45.8% of total applications from the prior week. The adjustable-rate mortgage share of activity increased to 9.2% of total applications from 8.4% the previous week. According to the MBA, the average contract interest rate for 30-year fixed-rate mortgages with a conforming loan balance remained unchanged at 4.74% with points decreasing to 0.45 from 0.47 for 80 percent loan-to-value ratio (LTV) loans. For the week, the FNMA 4.0% coupon bond lost 29.7 basis points to close at $101.672 while the 10-year Treasury yield increased 8.9 basis points to end at 2.788%. The Dow Jones Industrial Average gained 710.40 points to close at 24,706.35. The NASDAQ Composite Index added 185.75 points to close at 7,157.23. The S&P 500 Index advanced 74.45 points to close at 2,670.71. Year to date (2019) on a total return basis, the Dow Jones Industrial Average has added 5.91%, the NASDAQ Composite Index has gained 7.87%, and the S&P 500 Index has advanced 6.54%. This past week, the national average 30-year mortgage rate rose to 4.60% from 4.57%; the 15-year mortgage rate increased to 4.16% from 4.14%; the 5/1 ARM mortgage rate fell to 4.40% from 4.42% while the FHA 30-year rate increased to 4.18% from 4.17%. Jumbo 30-year rates increased to 4.38% from 4.34%. 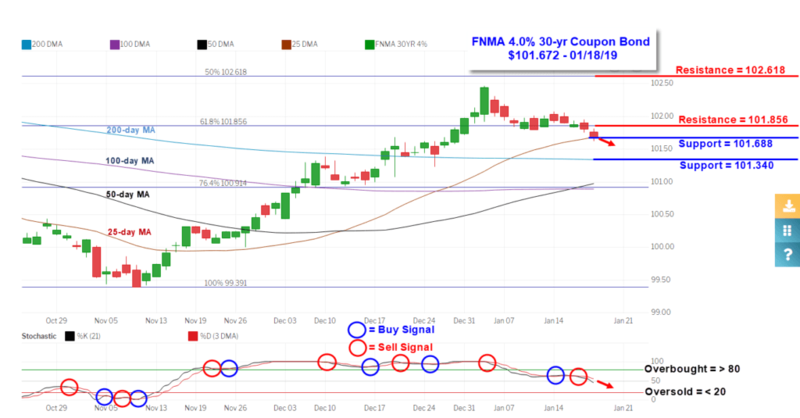 The FNMA 30-year 4.0% coupon bond ($101.672, -29.7 bp) traded within a wider 45.3 basis point range between a weekly intraday high of $102.078 on Monday and a weekly intraday low of 101.625 on Friday before closing the week at $101.672 on Friday. Mortgage bond prices were unable to hold above technical support at the 61.8% Fibonacci retracement level ($101.856) on Thursday, and then continued lower to test the next level of support at the 25-day moving average ($101.688) on Friday. The 61.8% Fibonacci retracement level ($101.856) now reverts back to become the closest resistance level. There was a sell signal last Wednesday from a negative stochastic crossover, and since the bond is not yet “oversold,” prices could continue to move lower toward secondary support at the 200-day moving average ($101.340). However, the major stock indexes remain overbought so we could see some weakness in stocks unless a positive catalyst emerges like favorable news regarding trade negotiations with China or the partial government shutdown. From a purely technical viewpoint, bond prices could trade between their 200-day moving average and resistance at the 61.8% Fibonacci retracement level with mortgage rates holding steady or moving slightly lower.